When it comes to boots, Paul Pogba is one of very few players in the World that has continually picked and chosen the pairs he wants to wear. After leaving Manchester United, he jumped between Nike and adidas boots as he looked for the perfect fit. 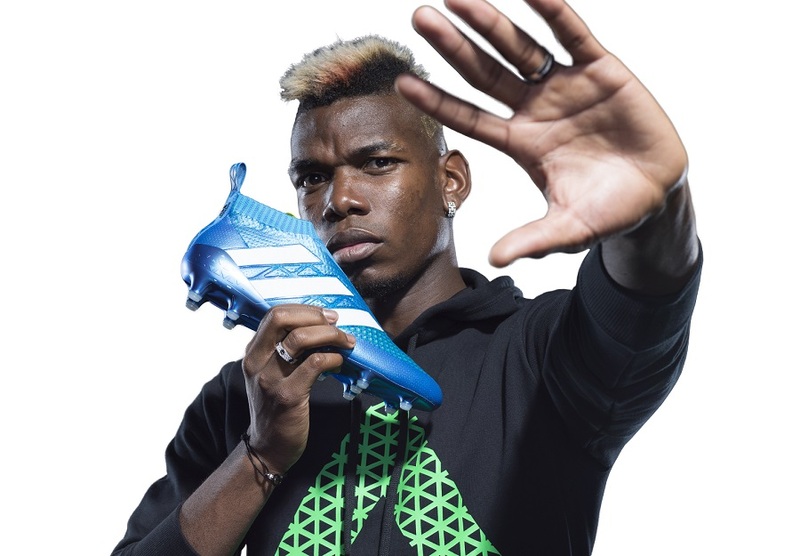 This past March, he signed a lucrative sponsorship deal with adidas, POGBOOM became a thing, and finally he has settled on the adidas PURECONTROL as his boot of choice. But what boots did he wear in between? And how did he end up in a world’s first knit, laceless boot? In his first stint with Man Utd, Pogba jumped between many different style boots. There was no trend necessarily, it just seemed like he was enjoying jumping between different pairs. Just in 2011 alone he wore pairs of adidas adiPure IV, adidas adiPOWER Predator, then he jumped to a pair of Nike CTR360 Maestri as United took on Leeds in a September 2011 Carling Cup clash, followed up by a pair of adidas f50 adiZero in the November Carling Cup Quarter Final match vs Crystal Palace. His final United appearance saw him wearing a pair of solar slime colored adiPOWER Predator. In 2012, the adidas Predator LZ was headlining the boot world, and that is what Pogba chose to wear as he started his Juve career. But it didn’t take long until he was back in Nike boots for what ended up becoming a long and successful stint in the CTR360 Maestri III. It became his staple boot and he obviously enjoyed the performance on offer as he stuck with them for an extended period. During the 2014 World Cup, he was wearing Nike boots including the Magista Opus and CTR360 Maestri III. But as is the case, all good things come to an end, and Nike choose to retire the CTR360. 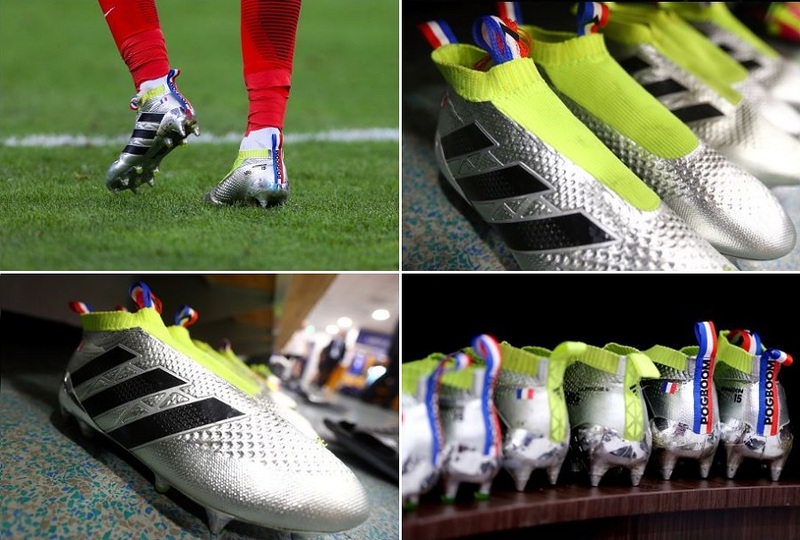 It then became a case of “what to wear next”, as Pogba transitioned back to adidas and 5 different versions of the Predator Instinct including the limited edition Predator Accelerator. But just as it seemed like he was sitting comfortably in the Predator range, he jumped ship back to Nike and the world’s first mid-cut collar soccer boot – the Nike Magista Obra – and it became his new boot of choice. 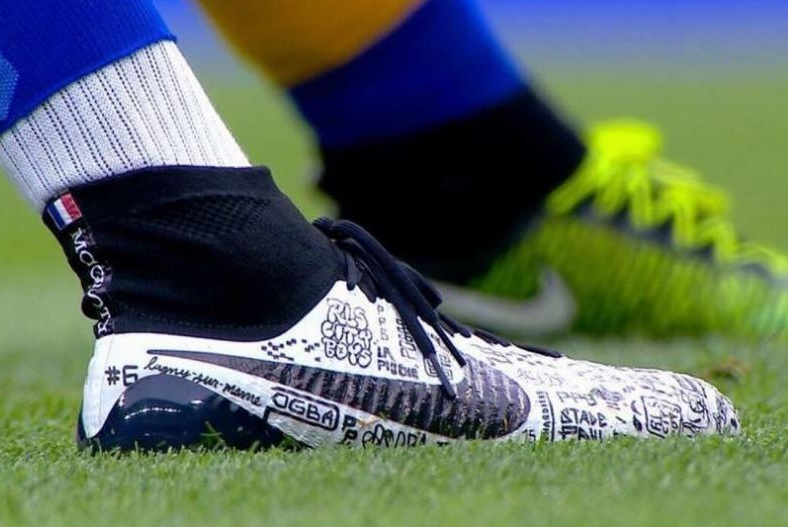 Even though he wasn’t an official Nike player, Pogba chose to create some custom Magista Obra as he expressed his personal style. Case in point the White pair with scattered sketches he wore in May 2015. Coming back from a period out injured, this was his way of setting a statement. Nothing about the design made sense and it basically looked like he’d taken a thin sharpie to the upper. Toward the end of 2015, he introduced a very significant “French edition” that paid tribute to the victims of the Paris terror attacks. What is interesting is that around this time, we were starting to wonder if Nike were going to get him signed to a contract and if he would become a feature player for the Magista Obra. Nike were in need of a signature star, and it seemed like Pogba would be the perfect player to highlight more custom designs. It seemed like a win-win. But, there was an elephant in the room, and they were making their own move! The final few months of 2015 became a very interesting period in Paul Pogba boot history, as that is when he became one of the first players to wear a mysterious blackout laceless boot – what we now know was the adidas PURECONTROL series. By March of this year, he was fully focused on adidas and finally signed his first ever sponsor contract. 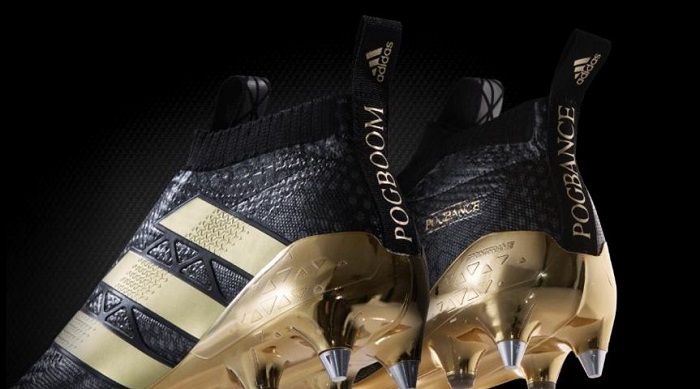 In return, adidas decked him out with a glorious, super exclusive pair of Black/Gold boots and introduced us to POGBOOM! Before you even ask, there were only 11 pairs created and none are available for retail. For the Euro Championships this summer, adidas decked him out with some custom Ace16+ PURECONTROL Mercury Pack edition, with an extra element of French flair. The pull tabs on the boot (essential for helping you get your feet in) feature the French colors, while POGBOOM was prominently displayed on the heel. Another statement look. What Boots Next For Pogba? One thing is clear, adidas are going to milk the huge money signing of Pogba and all the publicity he has floating around him right now. It took less than 5 minutes after his announcement for the below video to drop – so they knew this was officially happening for a while! The music video showcases Pogba’s famous swagger as he dances to ‘Nigo Duppy’ by UK Grime artist, Stormzy. With the EPL season about to kick off, it is unlikely we will see Pogba play right away. But when he does, I’d expect to see him wearing an extra special pair of PURECONTROL, maybe a fresh new Red/White/Gold colorway? Find all the latest PURECONTROL colorways currently released at soccer.com.